CSI PERFORM-3D was designed for nonlinear analysis and performance assessment for 3D structures. Traditionally, earthquake-resistant design has been strength-based, using linear elastic analysis. Since inelastic behavior is usually allowed for strong earthquakes, this is not entirely rational. Strength-based design considers inelastic behavior only implicitly. Displacement-based (or deformation-based) design considers inelastic behavior explicitly, using nonlinear inelastic analysis. Displacement-based design recognizes that in a strong earthquake, inelastic deformation (or ductility) can be more important than strength. PERFORM-3D allows you to use displacement-based design. Procedures for displacement-based design using inelastic analysis are specified in ASCE 41, ”Seismic Rehabilitation of Existing Buildings”. ASCE 41 applies to the retrofit of existing buildings, but the procedures can be applied to the design of new buildings. 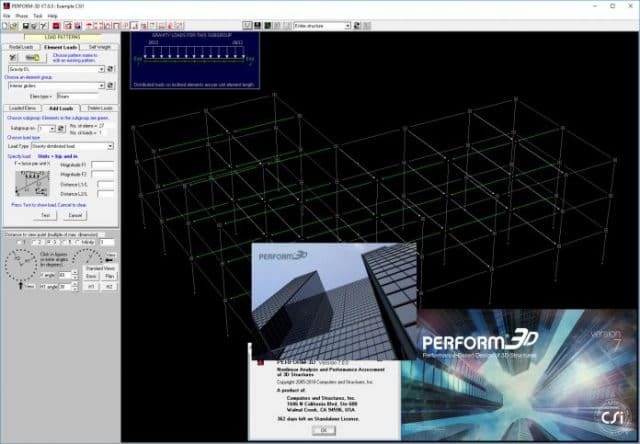 PERFORM-3D implements the procedures in ASCE 41. However, PERFORM-3D is a general tool for implementing displacement-based design. It is not limited to ASCE 41. The response of a structure to earthquake ground motion, whether elastic or inelastic, is highly uncertain. Capacity design is a rational way to improve the response of a structure in a strong earthquake, by deliberately controlling its behavior. Capacity design controls the inelastic behavior of a structure, by allowing inelastic behavior only in locations chosen by the designer. In these locations the structural components are designed to be ductile. The rest of the structure remains essentially elastic, and can be less ductile. Controlling the behavior in this way improves reliability, reduces the amount of damage, and can reduce construction costs. PERFORM-3D allows you to apply capacity design principles. PERFORM-3D has powerful capabilities for inelastic analysis, but it is not intended for general purpose nonlinear analysis. If you have no idea how your structure will behave when it becomes inelastic in a strong earthquake, PERFORM-3D can probably help you to identify the weak points, and hence can guide you in improving the design. However, PERFORM-3D is not intended for ”design by analysis”, where the engineer expects the analysis to determine exactly how a structure will behave. PERFORM-3D is a powerful tool for implementing displacement-based design and capacity design. It will help you to produce better designs, but it will not do the engineering for you. mas,, ada perform 3d v7 untuk yang 64 bit..?